In today’s modern world we use electricity to help us deal with the longer hours of darkness. But Abraham Lincoln lived in the time before electricity. When he lived in Indiana he would stay warm on these cool fall evenings sitting by the fireplace, and read by the light of the fire. 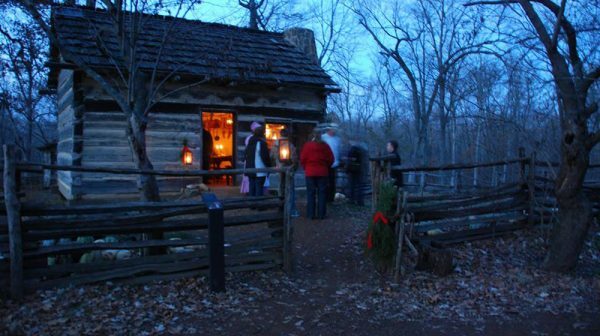 If you have visited the cabin at the Living Historical Farm and wondered what it would be like in the evening hours, come and visit during our Candlelight Evening programs. During these programs we will light the path to the cabin with candle lanterns. Bring a flashlight just in case, but please refrain from using it. Take a few moments to adjust to the limited light on the walk to the cabin. In the cabin, warm up by the fire in the fireplace and read by the firelight like Abraham did. Volunteers and park staff will be spinning and telling stories in the cabin illuminated by candles and lamps. Experience what it was like for pioneers like the Lincoln’s in the 1820s on select dates at the Living Historical Farm. A guest post by Paula Alexander at Lincoln Boyhood National Memorial.